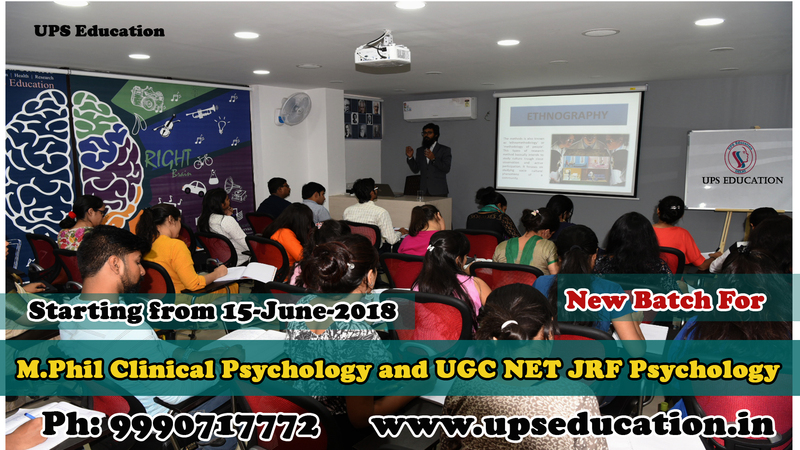 Dear Psychology Aspirants, are you planning to appear for M.Phil in Clinical Psychology Entrance 2019 or maybe you are planning to prepare for next UGC NET JR Psychology after July 2018. Then you do not need to worry about your upcoming psychology entrances. UPS Education going to start their new batch from 15-June-2018 for your Next Psychology entrance exams of M.Phil Clinical Psychology and UGC NET JRF Psychology Examination. Early start can increase your chance and it gives you sufficient time for your self-study. Join this batch and start your preparation with India’s No.1 Psychology Entrance Coaching. Registration process is already open for this batch. This entry was posted in Best CBSE NET Psychology Best CBSE NET Psychology, Best NET Psychology Coaching, Best NET Psychology Coaching in Delhi, Best Psychology Institute, CBSE NET JRF Psychology Coaching, CBSE NET Psychology Coaching, Coaching for M.Phil Clinical Psychology Entrance, m phil clinical psychology coaching, M. Phil Clinical Psychology Coaching, NET JRF Psychology Coaching, NET Psychology, NET Psychology Coaching, एम फिल क्लिनिकल साइकोलॉजी, एम फिल नैदानिक मनोविज्ञान and tagged Admission in m.phil clinical psychology entrance 2018, how to prepare for m.phil clinical psychology entrance, m.phil entrance coaching, net psychology entrance coaching on May 29, 2018 by UPS Education.